Yuri is the first patient who has successfully finished their TB treatment at MSF’s project in the Republic of Belarus in Eastern Europe. Yuri, 38, is celebrating a moment he thought would never arrive: he has been cured of a complicated form of tuberculosis (TB), an infectious disease caused by mycobacteria which usually attacks the lungs. 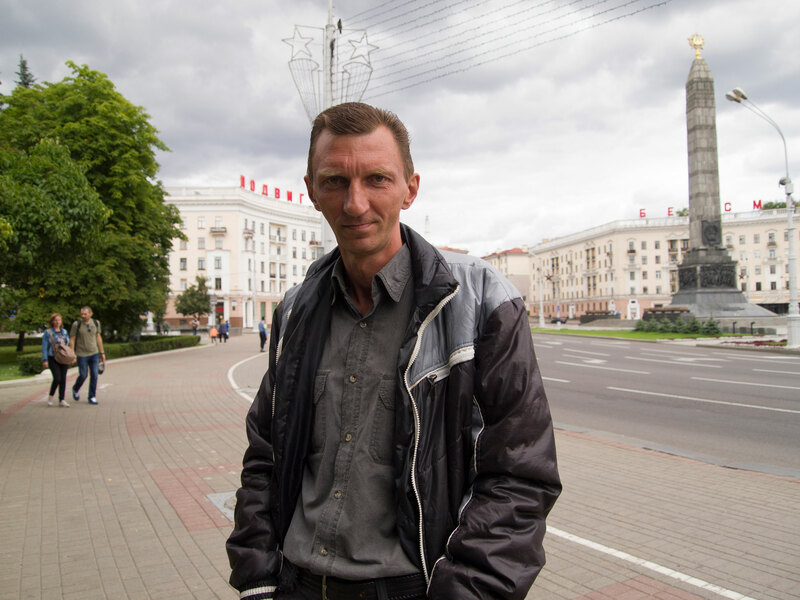 But a cure for Yuri is also a milestone for MSF: he is the first patient to complete treatment at MSF’s TB treatment programme in Belarus, run in close cooperation with the Ministry of Health (MoH). The programme started in the summer of 2015, with revolutionary new TB drugs supplied through MSF’s endTB project (endTB.org). By that time, Yuri, together with his doctors had been fighting the disease for two years, facing a form of extensively drug resistant tuberculosis (XDR-TB). Treating XDR-TB is a lengthy and difficult process because this form of the disease is resistant both to 1st and 2nd line TB drugs. Despite sitting in the blazing sunshine, Yuri does not take off his thick jacket. He explains, ‘I’m afraid that I can catch a cold in the draught somewhere, and that would be stupid…’ Our conversation about his recovery takes place amidst the hubbub of children’s voices. We are sitting on a bench beside a river bank in a big children’s park in the centre of Minsk. The kids sweep past us on their scooters and their mums, in summer dresses, can hardly keep up with them. Yuri says he made a promise that while undergoing his last chance of treatment he would take care of his health and not risk squandering what he calls a ‘lucky’ opportunity. Yuri learned he was sick in 2013. ‘For some reason I started losing my appetite, I felt weak. I was losing weight, others told me that. Then I got a fever. I went to the polyclinic, I thought it was a common cold. They did an X-ray and even found a small hole. As soon as I had my chest X-ray results they asked me: Do you know what you have? I said: How would I know?! Then they said “You have a suspected case”’… - He stops before ending the sentence. That’s because when speaking about TB, Yuri rarely mentions its name. When asked why, he tells me that after learning about what it was, he became too scared to even mention it in public. He was in a state of panic for several months and not so much afraid for his life or health but more concerned about the reaction of the others. MSF’s Dr Mikhail Khmyz (right) and social worker Roman Kuchko stand outside MSF’s office in Minsk, the Republic of Belarus. Photograph by Victoria Gendina. After a year of treatment, doctors found his first attempt at treatment was a failure. Yuri’s XDR-TB was resistant to the medicines that were available at the time. ‘When they poured more than 20 (pills) before me everything went dark before my eyes. And of course they make you feel really sick. Such a high dose at once. You feel nauseous, weak. God forbid. You’re feeling sick permanently. And it wasn’t just me who felt like this, everybody had it. In the morning they take the drugs and you won’t see anyone until the evening. Because everybody’s lying in bed. Somebody would throw up at once, others later,’ Yuri continues. Several times it seemed that the disease had abated and the tests would come back ‘clear’. But in a few months’ time they would be ’positive’ for TB again. Just when he’d begun to lose hope, the doctors told him about a new treatment program, from MSF. Yuri agreed to be admitted for treatment with MSF at once. ‘My doctors told me – this is the only chance. I had an advanced process with lung cavities growing already. It was getting worse and worse. I had drug resistance. They told me existing drugs won’t help,’ Yuri recalls. ‘And then it was immediate – in two days they inserted a port (an implanted system for continuous intravenous infusions) and the treatment started. Imipenem, Bedaquiline and several other medicines, that’s it. And I started to improve immediately. I didn’t feel better, I had no appetite. But the tests, the X-rays – everybody was surprised! They said: “That’s something! It’s fantastic! You have such a good dynamic!” Excellent dynamic. And already in October I had clear tests. Everything was clear. Everybody was surprised – nurses, doctors. And of course they were telling me don’t even think of skipping the treatment, you need to continue it,’ he adds. ‘You certainly get tired in two years. But what one can do. Thank god it has helped. If it wasn’t for this treatment we wouldn’t be speaking here right now,’ – says Yuri matter-of-factly. He is obviously used to this thought and phrase. For patients like Yuri, who’ve gone from having no medical options left to being cured, a combination of new technologies and medications – means more effective treatment - and in some cases - the difference between life or death. In the WHO Global tuberculosis report, 2016, Belarus is ranked as one of the highest-burden MDR-TB countries. MSF is supporting the Ministry of Health in four TB facilities to address these high rates: the Republican Scientific and Practical Centre of Pulmonology and Tuberculosis (RSPC PT), 1st and 2nd City TB dispensaries in Minsk, and City TB hospital in Volkovichi, Minsk region. About 70-75 patients each month are provided with psychosocial support (counselling, food parcels, transport vouchers, support by social workers) to help them stay on their treatment. So far MSF has provided treatment to nearly 60 patients, with new TB drugs supplied through the endTB project. Working in 15 countries, endTB is a partnership between MSF, Partners in Health, Interactive Research & Development and donor UNITAID, aiming to find less toxic and more effective TB treatments. You can read more about the program at endTB.org.